Three principles dictate how many work groups evolve into highly effective teams. There may be a million characteristics that typify but three resounding principles form the foundation for every enduring team. First, they have developed a Constancy of Purpose that permeates – that means every member fully understands why they have been assembled. And if that is limited to an organizational mission statement, a sales figure, or a profit goal you can be sure most will not buy-in – or choose to listen. Constancy of Purpose speaks to more human dimensions – and they are generally not extrinsic. Truly great teams evoke passion, speak to a larger mission, and allow the individuals tasked with that purpose to channel their own interests as well. 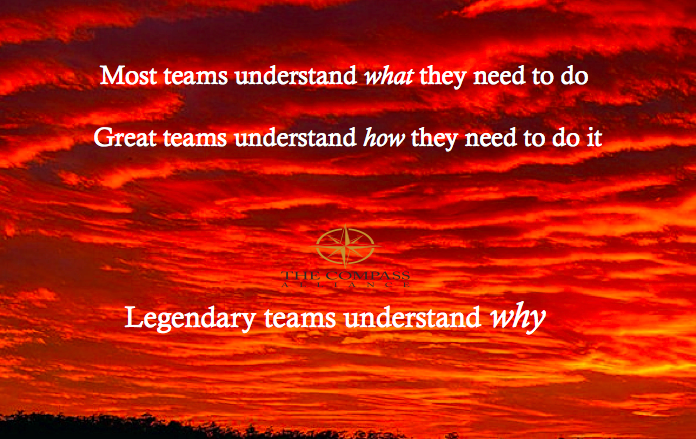 Ask any group about their reason for being and stand back – few have any idea, nor does their leader. And yet every year we watch companies whose vision and mission compel surge past the pack. Purpose that aligns with individuals’ goals and dreams REALLY matter. Apply that same litmus test we referenced in point #1 (“How will you realize your purpose?”) and be prepared for a rambling dissertation that will reinforce one thing – few groups think about the group challenges, they think about THEIR individual challenges. Transcendent teams invest tremendous time discussing roles and responsibilities – and how to align the two. Direction follows Purpose – not before. Direction demands interdependency – but interdependency doesn’t just happen. The third dimension – truly great teams enjoy Shared Ownership in the outcomes they hope to attain. This means EVERY member, EVERY time, EVERY day. They invest time assessing collective performance, agreed on contributions, and yes – ongoing opportunities. The “ask” that distinguishes the very few teams that fully own their responsibilities – “How often do you assess team performance and adjust to make sure you will reach your goals?” Spoiler Alert – After Action Reviews are a unique trait of many top military operations. They are virtually non-existent for most companies. Instead we march merrily ahead – to the next initiative, the next brand strategy or the next business cycle without EVER assessing whether what we have been doing is working – or isn’t. Legendary teams demand owners – and move quickly to evict renters. Three principles distinguish the few from the many – and they each answer a question that every team member carries with them. Why are we here – what’s our purpose? How are we going to realize that purpose? Three principles – three questions.